Anyone who's visited a children's playground in the past few years has likely noticed stark differences from the jungle gyms of the 1970s and early 1980s. Today's equipment is very sanitized. 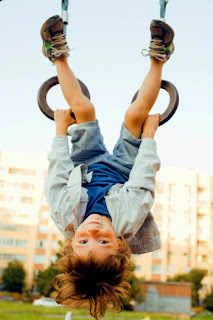 There are very few ways for children to possibly injure themselves. Signs clearly indicate the age appropriateness of the equipment and discourage smaller children from trying the equipment designed for older children. Over the past 30 years, it has been increasingly common for towns, cities, and designers of playground equipment to create playgrounds that maximize safety and minimize the risk for the children and themselves. Those who hang around playgrounds have also become accustomed to the sight of overprotective parents. These parents monitor their children's every movement and interfere at the slightest suggestion of a struggle or their child having a disagreement with another child. As a business leader, take the opportunity to embrace challenges when they arise. Continually playing it safe isn't the way to grow a company. Companies are able to grow and expand when the leaders test the boundaries of what the group is capable of achieving. In marketing, this means being willing to try new techniques or experiment with exciting ideas. The current leaders in marketing didn't get there by following the old leaders. Instead, they got creative with their ideas and experimented to see what worked. Businesses of all sizes can run the same types of experiments. Even small businesses can test to see what customers respond to better and what generates more conversations. Taking risks, stepping up and meeting challenges, and offering workers the chance to grow are essential keys to making a company successful. If you're looking for ways to start reaching for the stars and want to take your marketing to the next level, give us a call. We'd be happy to help you get started.